Every family has it strange characters. For mine it would have to be my great great grandfather, David Martin Pattan. Some might have called him eccentric, or even crazy , but no one really knows exactly why he did the things he did…or, as is the case for some parts of his life, why he did the things he did…over and again. 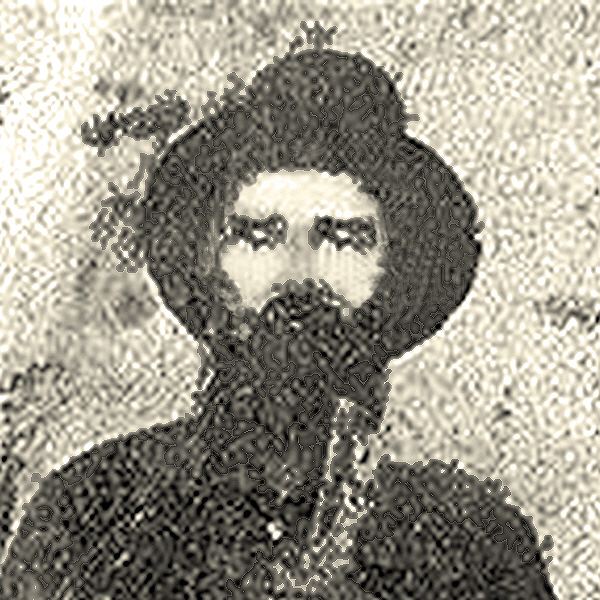 After David’s parents died on Ohio, which is where David was born in about 1828, he moved to Illinois and settled in Knox County near Gibson. He met and married my great great grandmother, Elizabeth Ellen Shuck on December 25, 1856 in Knoxville, Illinois. Together they had six sons and four daughters. 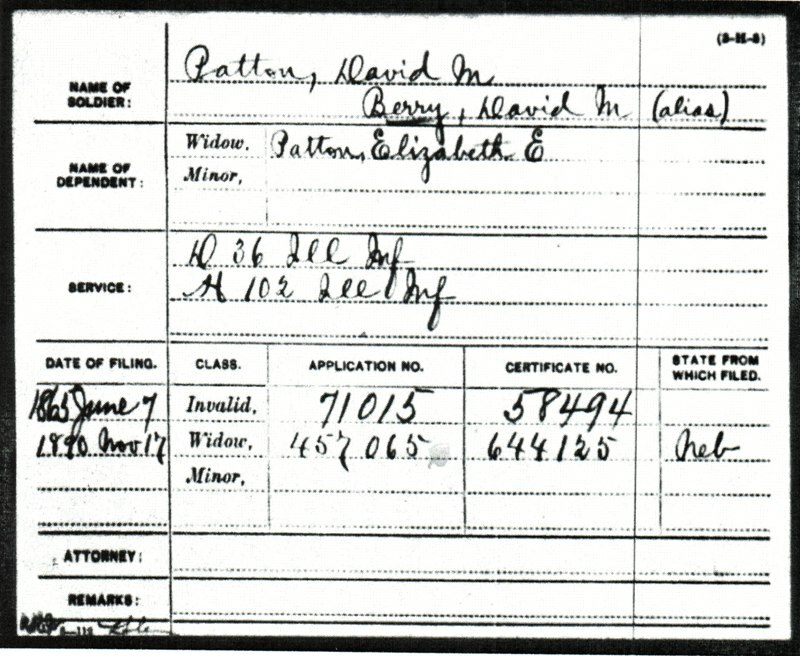 As I look at the marriage certificate, I looks like his last name was spelled Patten and Elizabeth’s was spelled Shuck. We have always spelled his Pattan and hers Schuck. 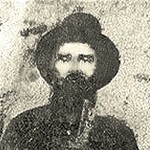 During the Civil War, he enlisted in Company H 102nd Illinois Volunteer Infantry on August 8, 1862, a little less than a year after his third son, Joseph was born. He was discharged on October 1, 1863, just 3 days before Joseph’s third birthday. At his discharge his had a disease of the larynx and bronchia that caused him not to be able to speak louder that a whisper for two months. He then enlisted in Company D36 Illinois Volunteer Infantry on September 27, 1864. It is unknown if he just forgot that he had already served, or if he just felt that his services were needed again. He was shot in the right arm, just above the elbow, in the Battle of Lookout Mountain in Tennessee on November 29, 1864. He spent the next five weeks in a hospital in Cincinnati, Ohio. Upon his discharge, he was sent back to his unit. He was discharged on May 20, 1865 with 1/2 disability. After David’s discharges from his times in the infantry, he and Elizabeth had their remaining seven children. At some point after the birth of their twins in 1876, David went to town and didn’t come back. He was gone for seventeen years. Then, one day in town, David’s son George, my grandfather, saw him in town. The sheriff was about to arrest him, when George offered to take him home. I guess he must have been drinking or causing some other such mischief that didn’t necessarily warrant jail time. Once home, they found out that he had been married to another woman and they had a son and a daughter, both of whom were named the same names as a son and daughter with Elizabeth. This leads me to wonder if something had happened seventeen years earlier that caused him not to remember the first marriage. That family died in a flash flood, so maybe that was why he was back. I have heard that he was married one more time…again without the benefit of a divorce, and when the third wife tried to collect his pension, she was denied because they weren’t legally married. No children were born to that union. I don’t know if my great great grandfather was just a man who liked to marry different women, or if there was truly something mentally wrong with him. 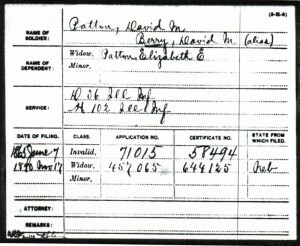 I have found out that his name was spelled every way you can possibly spell Pattan…Patton, Patten…and that for a time at least, he went by the alias, David Martin Berry. Berry was his mother’s maiden name, so I guess that worked. I have to wonder if he used the other names so that he could keep the wives straight…again, if he mentally knew that he was married. The research on his marriages is complicated due to these differences in names, but I have to wonder if the third wife, at least, went by berry, because that name is listed on the pension request, probably to avoid paying out twice. Whatever the reasons were for his double military service, and his three marriages, my great great grandmother took him back, and in the end cared for him until his dying day. They are buried together in Little York Cemetery in Warren Illinois.